This poem reflects on the Gospel scene we are reading tonight with many years of hindsight. And we do that later in the liturgical year as we reflect on the future lives of Jesus, and all those around him. It is already a hint of the complexity of this feast day. We have already celebrated the more straightforward birth of the human Jesus. Christmas has been almost taken over by both the commercialisation from about October onwards, and also the stresses around family gatherings and the expense of all the expectations around that of the right food and presents for all the children. 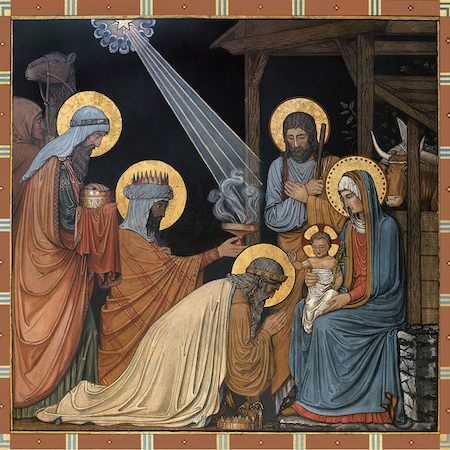 But the Feast of Epiphany is way more complex than the straightforward birth, partly because the feast originated in the Eastern Church, and Eastern thinking is not the same as our Western thinking, and partly because celebrating the divinity of Christ in the birth of Jesus is a complex theological reality. This feast is like a rich tapestry, weaving in four different aspects or themes of this great manifestation of the God-ness of Jesus. But again, there is complexity in the way the Church celebrates the theme. It includes the theme of manifestation over three Sundays, but also the idea of Royal Kingship, the theme of Light, and also that of the nuptials between Christ and his Church. The first theme is that of the Manifestation of God in Jesus. This is a more obvious theme, as it is what the word epiphany means from the Greek. It is celebrated over three weeks as we explore the Adoration of the Magi, the Baptism of Christ and the First Miracle at the wedding at Cana. An added theme in our readings this evening is that of opening up access to God for the Gentiles, that Christ has broken down the barrier between the Jews and the rest of the world. Its interesting to me that this Gospel was written for a Jewish audience. The idea of God being born as a man would be so monstrous that it would be blasphemy. We have got used to this idea over the years and centuries I think. It doesn’t bowl us over any more. When my son was living in Iran he was at a family gathering of a friend, and an aunt asked whether Christians really believed that God was born as a human being, as a man. My son said, Yes, we do believe that. She just roared with laughter, split her sides. Now you can choose to be offended by that behaviour, but I think it is the right response, because the whole idea is absolutely ludicrous. I mean, are you serious? Yep, we are, and that’s what this feast is reflecting on, and perhaps why it takes us several weeks to do the job properly. At Christ’s Baptism we are presented with the Trinitarian relationship of this God/man as he hears the Father’s affirmation and as the Holy Spirit descends on him. Then at the marriage of Cana his God-ness shines through his generous provision of wine. A second theme of Epiphany is that of Royal Kingship. We celebrated the feast of Christ the King at the end of the church’s year, just before we started Advent, and today’s feast celebrates the extension of Christ’s kingship to the whole world. This is symbolised by his revelation to these wise men, or eastern mystics, who represent the whole Gentile world. It is not just a few people or even just the Chosen Race who are called to believe in and worship Jesus as Christ, but the whole world. The third theme is that of Light, “Your light has come” or “the Lord has lit up your lives” as our translation tonight has it. During the season of Advent the symbolism was that of being in darkness and looking toward the light. Christmas celebrated the coming of the Light, but it was seen by only a few people who happened to be around the crib. But in this feast we acknowledge that “ As the brightness of your light intensifies, nations and their rulers will be drawn to you”. But it doesn’t just happen, this following of the light. Like the wise men, we need to have the courage to make the journey to search for this Christ, and the perseverance to persist when the going is not as straightforward as we would like it to be. It may also mean we need to go home a different way, “to take the back roads” and while we are meeting new people on these back roads, also transmit to them something of what we have seen ourselves. There is another theme which is not based on the historical events of Jesus life, but rather on the whole Incarnation, and that is the theme of the marriage of Christ to his people, to humanity. This theme is bound up with the epiphany stories, for example the wise men represent the Gentile world hurrying to present their gifts at the wedding feast, and the wedding of Cana has been used by the church to suggest the setting for this wedding. Both Paul and the book of Revelation refer to this wedding between Christ and his spouse, the Church. May we include ourselves in this guest list, bringing the gift of our lives to be “lit up” by the light of Christ, and inspired through our imbibing of the spiritual wine Christ provides for us through the Holy Spirit.